Only when a husband and wife know and respect each other's needs, choices, and freedom can they give themselves freely and lovingly to one another. 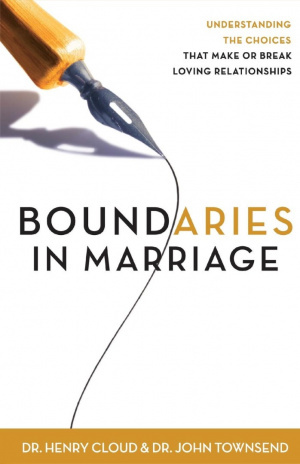 Boundaries are the "property lines" that define and protect husbands and wives as individuals. Once they are in place, a good marriage can become better, and a less-than-satisfying one can even be saved.;Drs. Henry Cloud and John Townsend, counselors and authors of the award-winning best-seller Boundaries, show couples how to apply the 10 laws of boundaries that can make a real difference in relationships. They help husbands and wives understand the friction points or serious hurts and betrayals in their marriage--and move beyond them to the mutual care, respect, affirmation, and intimacy they both long for. Protect their marriage from different kinds of "intruders"
Boundaries in Marriage by Dr. Henry Cloud, Dr. John Townsend was published by Zondervan in July 2002 and is our 8905th best seller. The ISBN for Boundaries in Marriage is 9780310243144. Be the first to review Boundaries in Marriage! Got a question? No problem! Just click here to ask us about Boundaries in Marriage.